Some parts of the United States will see a total solar eclipse today. This will be a lifetime event for many. The superstitious, Republicans, and other ignorant fools may want to stay inside: the Sun God is very, very angry with them. Here at Backyard & Beyond, we’re only getting a partial eclipse. (And this is written long before a weather forecast for the day, because hey, clouds happen.) It lasts from 1:23-4 p.m. here, with maximum coverage at 2:44. Take a late lunch. Remember not to look at the thing with your naked eyes! Put some clothes on ’em. I’ve been known to use the hole in my MetroCard to project the tiny image onto a business card. 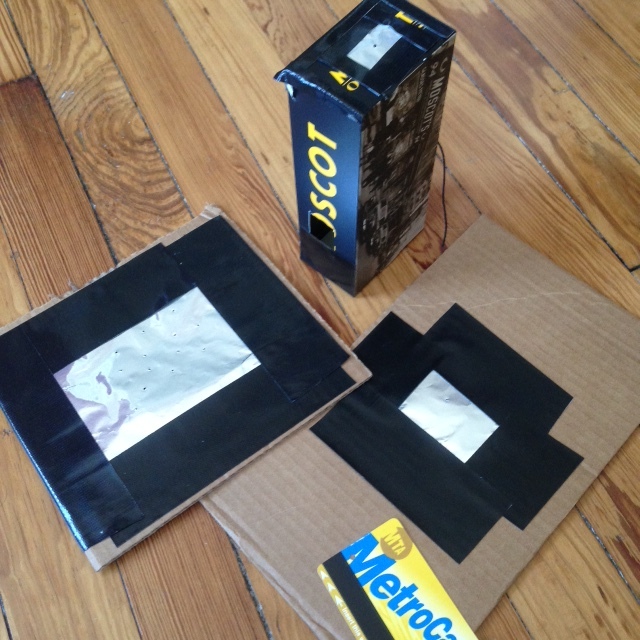 The hole in a MetroCard is rather bigger than a pinhole, but it still works. I hope to see some boxheads. This one looks good, too. I wrote this about Victorian eclipsers for JSTOR Daily. Also, try standing underneath a richly-leaved tree. You may have noticed in the past that the light that gets through the leaves hits the ground in soft circles. The tree is acting as a multiple pin-holed camera at large. During an eclipse, these circles will be eclipsed, and if it’s breezy they will moving with the dancing shadows. Did you hear the one about the person asking why the eclipse party couldn’t be held this coming weekend instead?